Aluminum Lay-In Grounding Connectors | CMC Type LI Connectors | Cal Fasteners, Inc.
CMC’s type LI lay-in grounding connectors are manufactured from 6061-T6 aluminum alloy, which ensures both maximum strength and superior electrical conductivity. These aluminum grounding connectors are dual rated for use with copper and aluminum connectors. 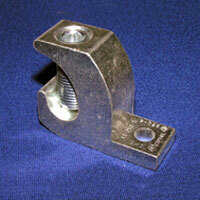 A special electro tin plating provides low contact resistance and helps prevent corrosion. Type LI connectors are designed for use on conduit grounding bushings. Their open-faced design allows installers to quickly lay-in the grounding connector as a jumper to multiple conduits with no break in the ground conductor. All CMC products are manufactured in North America and are UL listed, CSA listed, and RoHS compliant. Request a quote for CMC lay-in connectors, or contact Cal Fasteners to learn more.